Originally published on Couple Money. I wanted to share some potential useful information to help readers looking at saving money when paying down their high interest debts and for those looking at keeping the card afterwards for rewards. 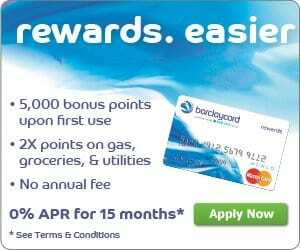 Right now Barclay’s Reward Card has some handy perks that help you accomplish both those goals. If you have a large amount of credit card debt and you’re looking to pay it down faster, having to pay no interest can be helpful. What I appreciate as a nice benefit with the card is that there is a 0% introductory rate for 12 months on balance transfers and purchases (afterwards it goes to a variable rate current 14.99%, 19.99% or 24.99%). Using the debt snowball method, you can shorten the time it takes you to pay off debt. You can transfer you highest debt over to the card, saving you from having your debt from growing faster as you focus on the smallest balances first. You can then tackle the Barclay card’s balance. Another perk to having the Barclay Rewards MasterCard is that you can continue to use the card after you’ve paid off your high-interest debt, you can keep the card and use it for the rewards. Keeping the account in good standing over time can also help your credit score as 35% of your score is based on your payment history and 15% is based on the length of your credit history. Reward credit cards can be used for a variety of purchases. As with any credit card rewards program, the benefits are only worthwhile if you pay your bill in full every month and avoid interest fees and late charges. There is no annual fee with the cards, so that means you don’t have to worry about making up for the annual fee, like many other reward cards. When you make your first purchase with the card, you get 5,000 bonus points ($50 cash back). As for their regular rewards, you earn 2x points for every dollar spent on groceries, gas, and utilities and 1 point for every dollar spent on all other purchases. If you’re already going to be making purchases every month, it may be useful for you to go ahead and put it on your card to earn rewards and then pay your bill in full every month. If you’re worried about missed payments you can protect yourself from yourself and automate your credit card payments with online bill pay. Most banks and credit unions offer this feature for free. If you want to take advantage of their 0% APR for balance transfers AND their rewards program, open an account with Barclay today!